Ahlquist v. City of Cranston. The Becket Fund for Religious Liberty (n.d.). Retrieved from https://www.becketlaw.org/case/ahlquist-v-city-cranston/. Ahlquist v. City of Cranston. (Apr. 04, 2019). https://www.becketlaw.org/case/ahlquist-v-city-cranston/. "Ahlquist v. City of Cranston." The Becket Fund for Religious Liberty. Accessed [Apr. 04, 2019]. https://www.becketlaw.org/case/ahlquist-v-city-cranston/. The Becket Fund is defended the School Committee of the City of Cranston, Rhode Island against a lawsuit from the ACLU of Rhode Island. The ACLU sued the School Committee over a historic mural designed by students that has existed in Cranston High School West’s auditorium for almost 50 years. According to the Committee, the lawsuit is a misguided attempt to rid public buildings of historic references to religion. 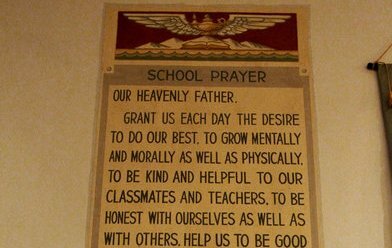 The Supreme Court has made clear that displays on public property, like the one at Cranston West, can contain some historically significant references to religion because the government can promote history and art without promoting religion. That hasn’t stopped the ACLU from attempting to scrub the historic mural off the walls of Cranston West High School. The federal district court in Rhode Island ruled against the School Committee of the City of Cranston on January 11, 2012.